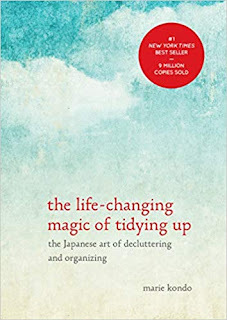 Was happy to read Susan Branch's post on "Tidying Up" via the KonMari Method! Susan has a lovely way of expressing herself in her books and on her blog, and she even made the act of decluttering seem easy and beautifully done. You can read her post on her Marie-Kondo-inspired decluttering HERE. I know I'll never have perfectly pressed dinner napkins like Susan, but still I love to read about hers as I dream of my "perfectly done" house on Someday Isle...as in "someday I'll..."
Whenever I visit Susan's blog, I'm always inspired to decorate with the things I have, putting out the everyday things we use and love rather than hiding them away in the cabinets. The other thing I want to share has to do with Marie Kondo too! Middle Daughter has "Kondo-ized" her house so much her children (Livvie 6 and Ben 9) have done (and re-done) the playroom so many times they've become experts at purging and organizing too. Livvie noticed Nana's bottom kitchen cabinets were somewhat messy, so both kids got to work removing all the pots and pans. After Nana chose the things that "sparked joy" for her, the kids organized the bottom cabinets and left everything clean and tidy. Livvie Not Always Clean And Tidy! Nana was (to say the least) very impressed with the job they did in her kitchen. 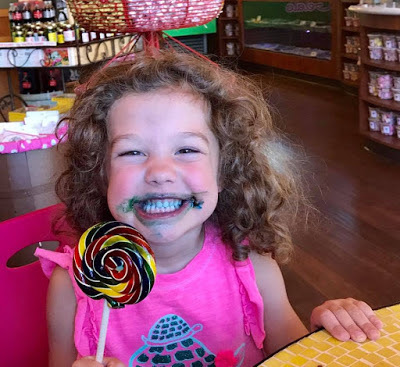 Nana laughed when she told Middle Daughter that Livvie even gave her a warning that she would be checking the cabinets next time she visits to make sure Nana is able to keep everything in its place! The thing I love about Marie Kondo's book is that it inspires people to buy less, store less, and enjoy life more. Golly, those are some amazing grands! I am totally impressed! 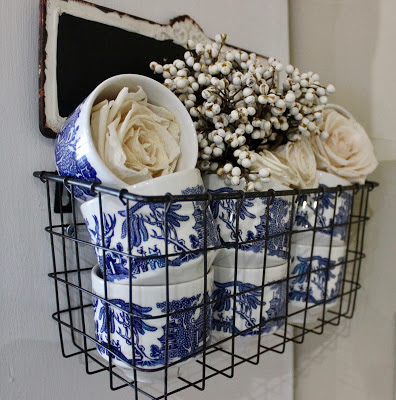 I love Susan's blog too -- and I know what you mean about choosing to decorate with things you already have. I learned a long time ago that it does no good to keep things in the closet where you can't enjoy them. If you do, then they aren't worth having and someone else can enjoy. I love how you arranged your blue bowls -- and that quilt is to die for! I'm a rabid quilt collector of (mostly) vintage quilts. I can't resist a patchwork! Jeanie, coming to see if you have a blog where you share info on quilts. I have two passed down from my mother in law, which the ladies in her family made in the 30's (?) and the 80's. 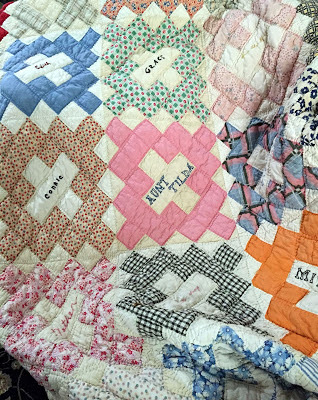 The one I showed here is from the 30's where all the women signed their name and made a quilt piece out of it. I don't have a specific quilt blog although now and then I'll put some on my Marmelade Gypsy blog. 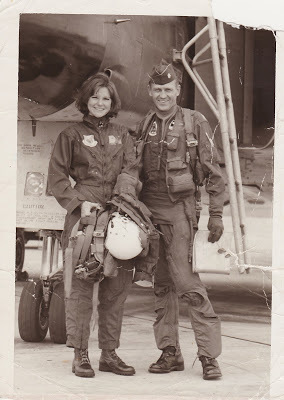 Those you have from the family -- Wow. Those are real treasures. Her book is all the rage, which puzzles me immensely. I've previously read so many wonderful authors who have encouraged women to declutter and organize. I presume Marie is the current "fad" as others have been in the past. I love Susan Branch...her art is so beautiful and light and her blog and books always cheer me up! Love and hugs! Benita, believe me when I say I have every trendy organizational/decluttering book that's ever been printed! But somehow Marie Kondo's method really struck home with all the women (and now kids) in our family/friends. I haven't read the book, but I purge every Season! I'm using more, storing less and making more thoughtful purchases. The grands are too, too cute! What a sweetie your Grandaughter is. Thanks Mama! She is so sweet she melts your heart, that's why she gets away with doing everything her way. Her other grandma "Nana" doesn't have a chance against her because she only had 2 sons. I "Grammy" had 3 daughters myself so I know how charming those little girls can be. I have enjoyed watching Marie Kondo also. I'm not sure I can do it quite like she does though! 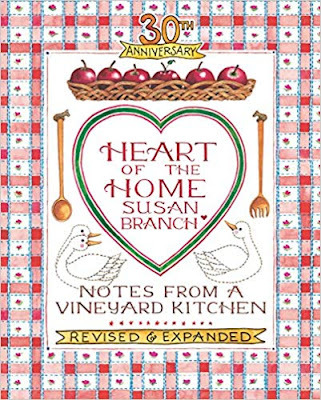 Susan Branch is a real favorite! I love her blog, books and I get a new SB calendar every year. Lisa, you've renewed my faith that I may yet throw ladies' parties like you do now that I know you had those cute lunch box meals catered! I've been trying to do some organizing and have watched that show too. I think I need a cute helper like yours! I wish I was close enough to utilize her skills! She even folds her undies the KonMari way and keeps them organized. I haven't read the book. The only clutter I've gained in the last year is all the stuff from my parents house, which I'm not quite sure what to do with it. I have crap everywhere but as my mother is still alive, I just don't feel I can chuck it all away. Or even give it away. I love the idea of Someday Isle, I practically live there already. This is so precious, it seems I might need to read that book.Thanks for sharing. That's the book I keep meaning to order and then forget as soon as I leave the computer. I love the story of Nana and Livvie. She is such a cutie pie, and has beautiful hair.